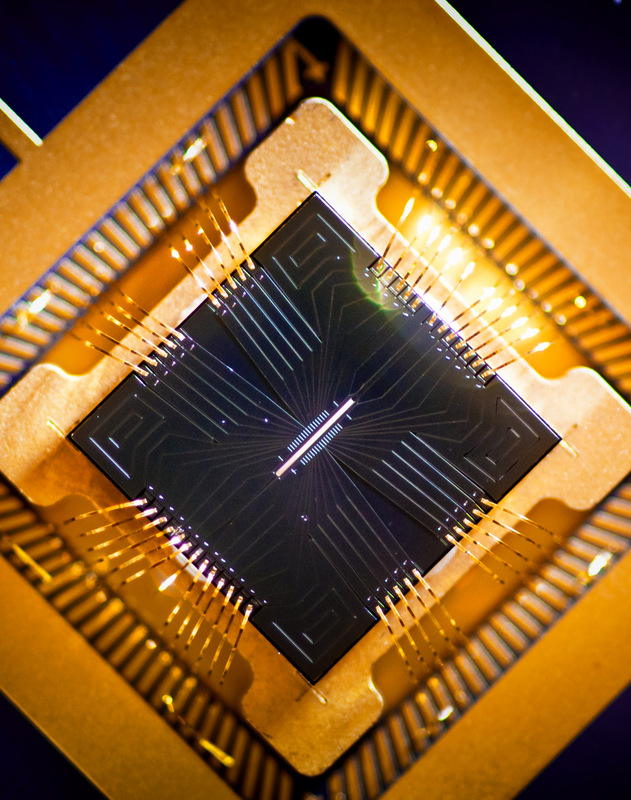 Recently Science Magazine invited JQI fellow Chris Monroe and Duke Professor Jungsang Kim to speculate on ion trap technology as a scalable option for quantum information processing. The article is highlighted on the cover of this week’s (March 8, 2013) issue, which is dedicated to quantum information. The cover portrays a photograph of a surface trap that was fabricated by Sandia National Labs and used to trap ions at JQI and Duke, among other laboratories. Trapped atomic ions are a promising architecture that satisfies many of the critical requirements for constructing a quantum computer. At the heart of quantum computers are qubits, systems maintained in two or more quantum states simultaneously. Here, the qubits are manifested in the internal energy levels of the ions, and are manipulated through laser and microwave radiation. These technologies are a key factor in the success of atomic ions: scientists can set the frequency of the radiation to match that of the ion’s energy level spacings with extreme precision. The qubits have long coherence time -- meaning they can be placed in quantum states and remain that way long enough to perform calculations. The qubit’s states are not sensitive to ambient disturbances like magnetic fields, giving them inherent protection from the destructive environment. Additionally, the ions are in a vacuum of lower than 10-11 torr. This is about 100 trillion times lower than atmospheric pressure. To visualize this daunting number, imagine light particles like hydrogen or nitrogen in a vacuum chamber. After special pumps remove most of the air, there are so few molecules left that before one molecule will collide with another, it will typically travel a distance comparable to the circumference of the earth. At atmospheric pressure, even though we can’t see them with our eyes, there are so many molecules floating about that they only travel about a hundredth the width of a human hair before they bump into a neighboring particle. Scientists want to go even further. Using cryogenics (cooling to near absolute zero temperature), they expect to push a few more factors of ten lower in pressure. Cooling the system is effective because it makes the molecules stick to the walls, thus removing them from the region where the ions rest. 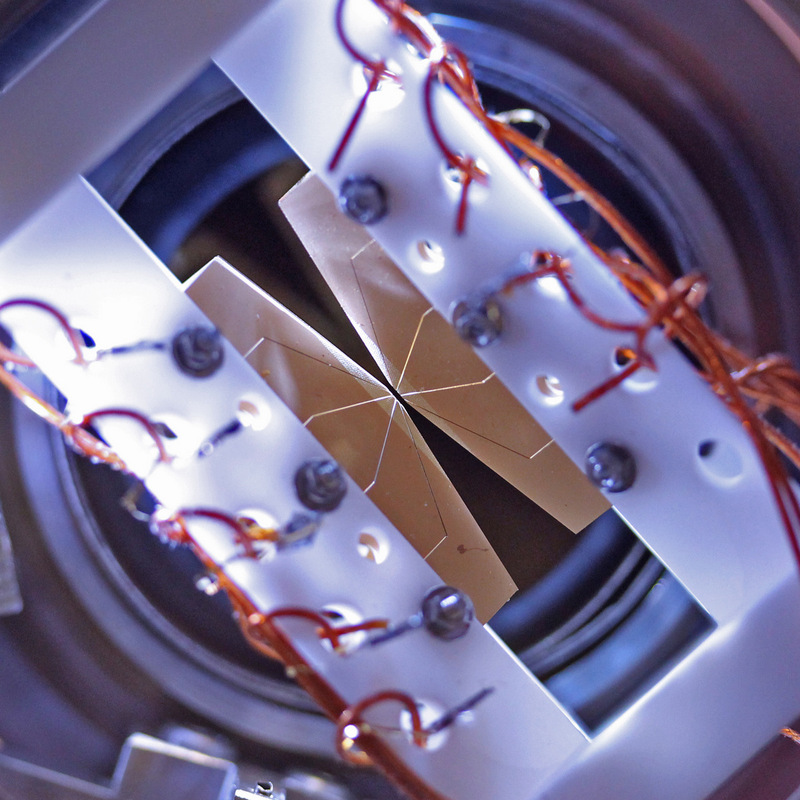 Ion traps themselves were invented more than a half-century ago, but researchers have implemented new technologies in order to store large ion crystals and shuttle ions around as quantum operations are executed. Professionally micro-fabricated devices, like the one shown on the cover, resemble traditional computer components. Some researchers are also integrating optics on-board the traps. Although quantum logic operations in such chip traps remain elusive, the obstacles are not prohibitive. In the US, researchers at institutions such as NIST (Boulder), Sandia National Labs, Georgia Tech Research Institute, JQI, Duke, MIT, and others are now, often collaboratively, fabricating and testing these technologies. Monroe and Kim are part of a larger collaboration called MUSIQC, which stands for Modular Universal Scalable Ion-trap Quantum Computer, and is supported by the Intelligence Advance Research Projects Activity (IARPA). This program focuses on building the components necessary for a practical quantum computer. The effort involves national labs, universities, and even private small businesses.